Removing the excess moisture from the tofu is the key to achieving crispy fried tofu. You can use any firm tofu. I bought mine from a Korean supermarket but I also use it from Waitrose. I find Waitrose’s tofu is much firmer than most Korean ones. Place the tofu block on either a bamboo mat so simply on your chopping board onto layers of kitchen towel. Lay more kitchen towels or a slice of bread on top of the tofu, gently pressing down with your hand to remove the extra moisture. Leave a small weight on top and soak up any water from the sides. Remove the paper towels or break and then repeat with new ones to soak up and soak out the moisture as much as possible without crushing or crumbling the tofu block. Slice the tofu into about 1 inch cubes. Lay the tofu cubes on two or three layers of kitchen towels as shown in picture. Again remove excess moisture using more towels or sliced bread, patting the tofu gently and drain away the water. Season the tofu cubes by sprinkling a pinch of black pepper and salt. The sauce we use is the same as sauce as in my Yangnyeom Tongdak recipe. Prepare the sauce fully and then return to the tofu. We are going to coat the tofu cubes three times in total. Add 4 tablespoons of Korean flour (or my alternative) to a shallow bowl and coat each tofu cube by rolling carefully in the flour then remove and set aside for 5 minutes. Repeat this process twice adding more flour each time. Try to avoid the tofu cubes sticking to each other. We are going to fry the flour coated tofu three times in total. 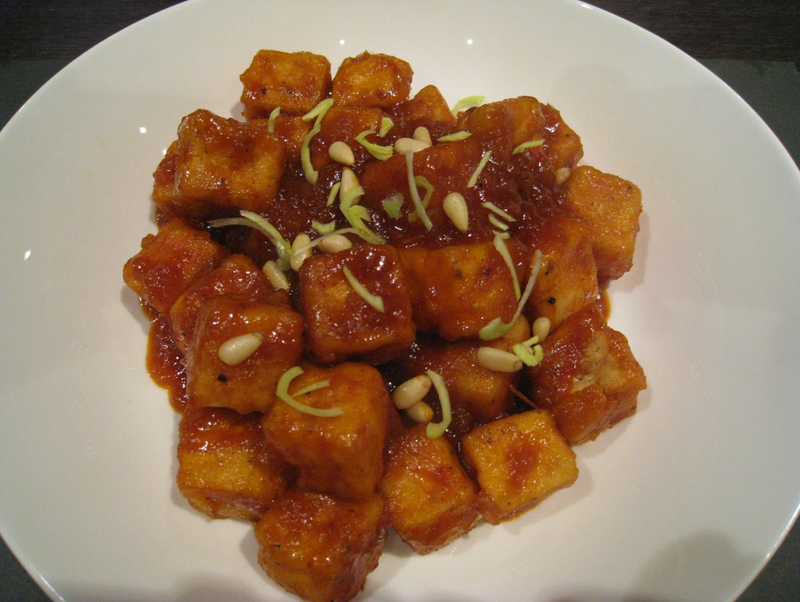 When the oil is heated to at least 170-180 degrees C, carefully drop the coated tofu cubes into the hot oil for 1 or 2 minutes stirring occasionally until the coated tofu cubes become a light brown. Fry again and drain twice for one minute each time until the cubes are crisp and golden brown. After the tofu is ready and placed in a serving bowl, reheat the sauce. You have the choice of serving the sauce over the tofu on the side for dipping. I like to provide both options so that there are two different textures available. Sprinkle the some pine nuts or chopped pistachio and chopped chives on top of the sauce and serve immediately.